These training manuals are self published ctma training manuals. This includes a complete line of self-paced reference books which can be used for classroom training. 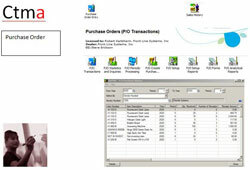 The publications are intended to be used for Sage 300 ERP (formerly Sage Accpac ERP). These publications are designed to assist Sage 300 ERP professionals with classroom training or by individuals to read independently, becoming more proficient in the use of Sage 300. By giving each person a pdf of the manual you will give them a valued resource. The manual can be printed by page or in its entirety. It is available in an electronic document. The manuals are written by myself, a Sage 300 ERP Certified Professional. Today I am still the author of the manuals with several people editing and translating as needed. I am active in the Sage 300 (Accpac community). The manual is an in depth manual whose content is second to no one. This value, we feel, is what companies are looking for in the fast past business environment. I offer web training classes upon request. The agenda is always customized to your needs. Contact me for additional information. The System Manager includes a complete discussion and review of Administrative Services, which is comprised of Security, Customization Directories, Data Integrity, Data Activation, Database Dump, Database Load, UI Profile Maintenance, Assign UI Profile Maintenance and Restart Maintenance. Common Services is comprised of the Company Profile, Fiscal Calendar, Currency, Scheduling, Optional Tables, Report Designer, Bank Services, Tax Services and Web Access. The Accounts Payable manual explains the setup, control, recording of invoices, tracking, and payments. We further explain how to use the information contained in the system about the invoices for goods and services used in your company. The Accounts Receivable manual explains the setup, control and use of the system. We will explore the invoices done in Accounts Receivable and those received from Order Entry. We will review the setup and design of the system. We will review other transactions, such as payments, interest charges, refunds and adjustments. The General Ledger manual explains the setup, control, and how the various inputs are received and posted. We will look at the standard reports, financial reports and review the inquiry and reporting tools. The General Ledger works with Excel to generate financial statements. The Inventory Control manual explains the setup, control and use of the Inventory Control system. We will look at Inventory transactions, tracking inventory, reporting and inquiry. The Order Entry manual explains the setup, control and use of the system. We will review quotes, orders, invoices and credit notes. We will look at the different options. The Purchase Order manual explains the setup, control and use of the module. We will review requisitions and purchase orders. We will explore the different ways of creating purchase orders. We will review the reporting that assists you in monitoring the system. The US Payroll manual explains the setup, timecard input, calculation and processing of payroll checks. We will also review State and Federal Reporting. The Canadian Payroll manual explains the setup, timecard input, calculation and processing of payroll checks. The Project and Job Costing manual explains the setup, control and use of the system. It also explores receiving transactions from other modules such as Payroll and Accounts Payable. The RMA (Return Material Authorization) manual reviews the setup and operation of the RMA module. The manual will assist you in working through examples of using the module. Buy ctma courseware and training manuals from our secure online store!